So our year started off with a bang at Elizabeth’s Cake Emporium HQ. We were very honoured to be chosen to make the largest and most elegant luxury wedding cake anyone had ever seen for what has been deemed the wedding of the year, even though it’s only January! As if we were not under enough pressure, when we heard that Elton John and Mariah Carey would be performing at the wedding we knew we simply had to create an impressive and memorable wedding cake. Our client’s vision was for an elegant and fairly traditional wedding cake with thousands of the most realistic sugar roses and sugar flowers. We took our inspiration from the colour scheme of white and soft pastels of blushes and lilac; and the ultimate luxury metallic – gold. Standing at 10 feet tall (it would have been even taller but a number of tiers had to be removed as the cake would not have fit perfectly under the ballroom’s chandelier otherwise) and 5 feet in diameter, it was the biggest cake anyone had ever seen and took 4 men to carry the base alone. The wedding cake was decorated with baroque swags and embellishments painted with sheets of edible 24 carat gold. We used custom made silicone moulds to create the round gold sugar brooches on the cake which matched those on the invitations. 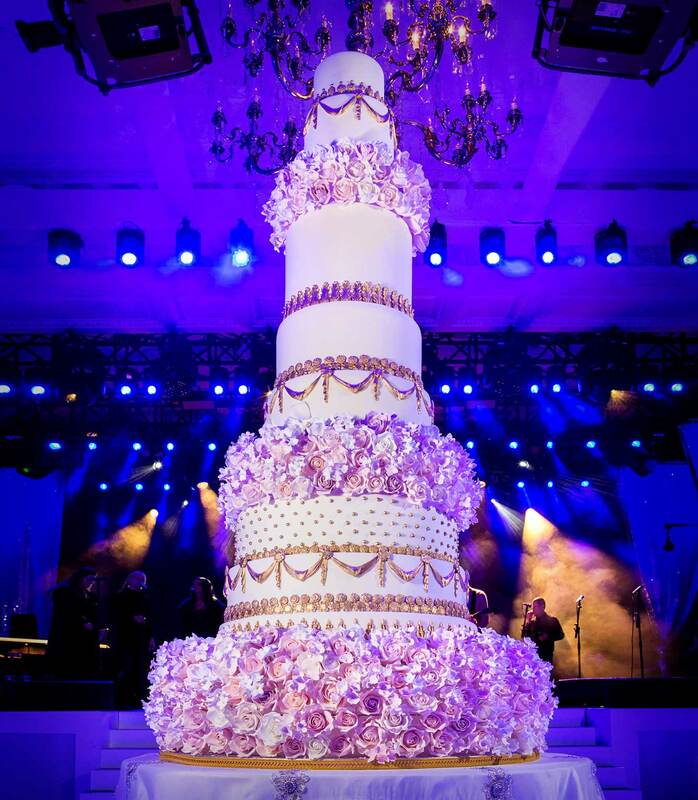 The huge wedding cake also featured 10,000 handmade sugar flowers including sugar roses in shades of white, blush and lilac, sugar blossoms and sugar hydrangeas. 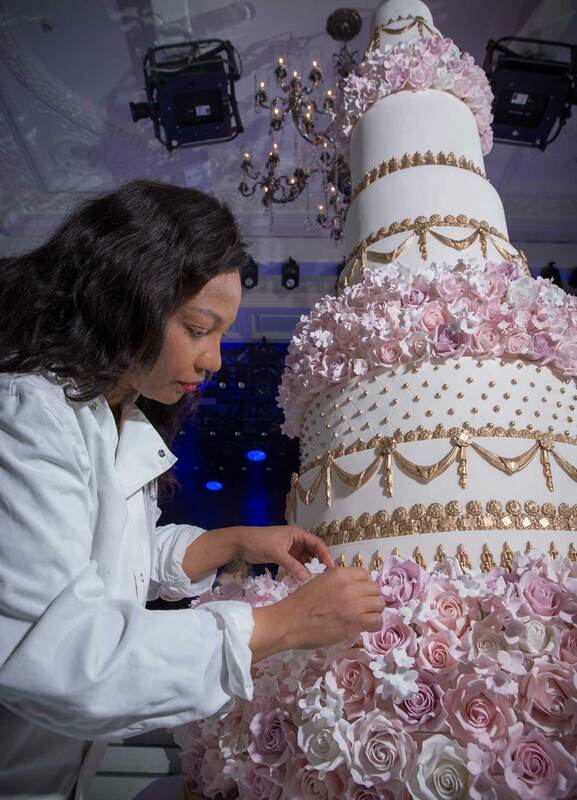 The sugar flowers took over 300 hours to make by a team of four. The cake flavours included vintage Champagne and Strawberries, Peaches and Cream, Sicilian Lemon, Red Velvet and Triple Chocolate Delight and over 1,000 duck eggs went into the making of the cake. 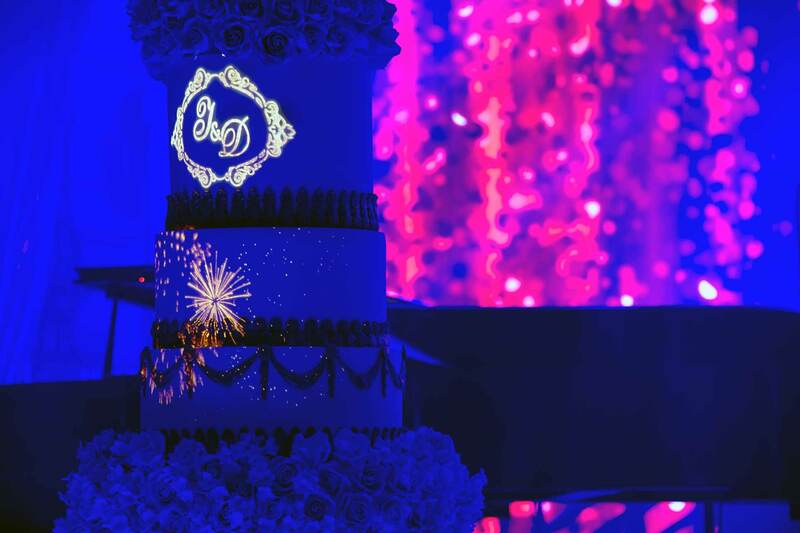 Using the latest projection mapping technology, images of the couple’s monogram, wedding date and other favourite characters such as Tinkerbell were beamed on to the cake during the cake cutting ceremony. The result was a stunning and very grand luxury wedding cake fit for the loveliest and most blessed of couples. It is no wonder images of the cake went viral and was reported the press globally after being featured alongside those of Elton John and Mariah Carey who played incredible sets at the wedding. Image credits Nek Vardikos of NV Photographers and Anthony Craddock Photography. Video credit to Jade of Jade Gooch films.